Wood suitcase, made in Camp Petawawa, 1940-1942. The sides are adhered using finger joints. Two different stains seem to have been used. Nail heads are visible, as are metal attachements for the handle and the metal hinges for the suitcase lid. Given the nature of the object, it likely had a functional use -- storage of personal items while in camp and transportation of personal items home when released. This suitcase is part of a group of wood objects collected and preserved by the family of internee Girolamo (George) Capponi. 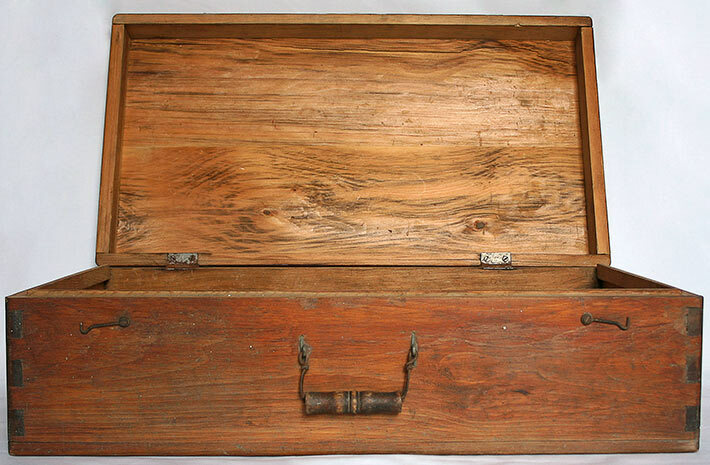 The suitcase along with other wooden objects in the collection, may have been made by Capponi himself. He had written to his wife asking for wood-working tools.